Enjoy Homemade Soft Serve from Twistee Treat! Did you ever drive by the 25-foot high fiberglass ice cream cone on your way home on a hot summer day? If so, you just passed Twistee Treat, the place to go for the best homemade soft serve ice cream. With their fun and welcoming atmosphere, Twistee Treat has brought happiness to each guest who comes to enjoy the quality ice cream they serve. Founded in 1983, their growth has become exponential, as Twistee Treat continues to follow the philosophy of giving each guest a treat for eyes and taste buds when they grab a hold of their soft serve ice cream. The rich, smooth flavors are sure to please anyone’s pallet. The menu highlights various flavored ice creams, cones, cups, shakes, and malts. Traditional classics like the banana split along with another favorite, the brownie boat, continue to be a popular choice. 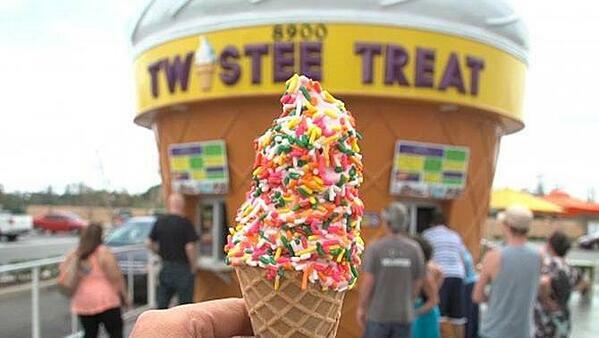 Twistee Treat also offers twirls with your selection of candy, sundaes, and slushies. Adding more variety to their product offerings are their cookiewich and waffle taco, and even hot dogs are available. If you passed by it, turn around and place your order at the window! We celebrate our client, Twistee Treat: https://twisteetreat.com.